The Russian Investigative Committee has identified a key witness to the MH17 crash in Ukraine’s Donetsk Region. He is Evgeny Agapov, an aviation armaments mechanic in the Ukrainian Air Force. Agapov, a Ukrainian citizen, was serving as a military mechanic in the first squadron of the Ukrainian Air Force’s tactical aviation brigade. Agapov has testified that on July 17, 2014, a Ukrainian Sukhoi Su-25 jet aircraft piloted by one Captain Voloshin “set out for a military task,” Markin said. The aircraft returned to the airfield with empty ammunition. To his colleagues, Voloshin said that the plane was "at the wrong time or in the wrong place,” said the Investigative Committee spokesman. 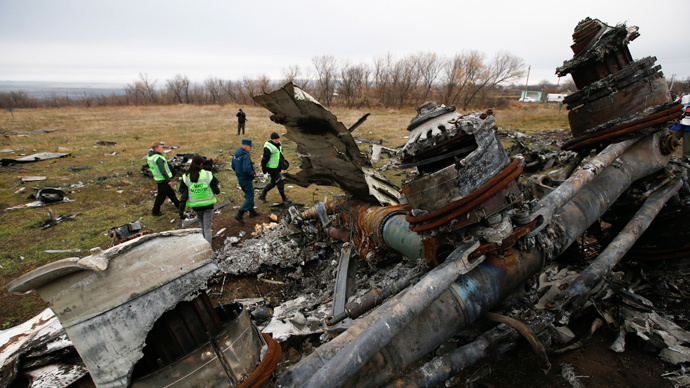 On Tuesday, Russian arms manufacturer Almaz-Altey announced the results of its own probe into the MH17 tragedy. They say that the crash could only have been caused by one of the missiles from BUK’s older line of defense systems, the BUK-M1. These missiles are widely deployed by a number of post-Soviet states, including Ukraine, but have been replaced by a newer model in Russia. “If a surface-to-air missile system was used [to hit the plane], it could only have been a 9M38M1 missile of the BUK-M1 system,” Almaz-Antey said in a statement. In the meantime, Almaz-Antey’s experts said they had not “theoretically” excluded the possibility that the Boeing was hit by another type of weapon, such as an air-to-air missile. They cautioned that that final conclusions could only be drawn after all the necessary forensic tests had been conducted by the official investigative commission. The Malaysia Airlines flight MH17, with 298 passengers on board, crashed on July 17, 2014 in the Donetsk Region of eastern Ukraine. The Boeing was en route from Amsterdam to Kuala Lumpur, and the majority of its victims were Dutch citizens.